Hill & Valley Online Press Room | Sugar-free and no-sugar-added snacks and desserts that taste great! We’ve loaded this site with lots of information about Hill & Valley, Inc. – America’s largest, exclusive manufacturer of sugar-free and no-sugar-added snacks and desserts. You’ll find plenty of background information, low and high-resolution images (photos and illustrations), current releases and archived news/feature stories. And, of course, if there is information you require (or to request an interview), please let us know what you need and we’ll be glad to round it up for you. Kroger and Hill & Valley team up with Hoosiers to step out and fight diabetes. 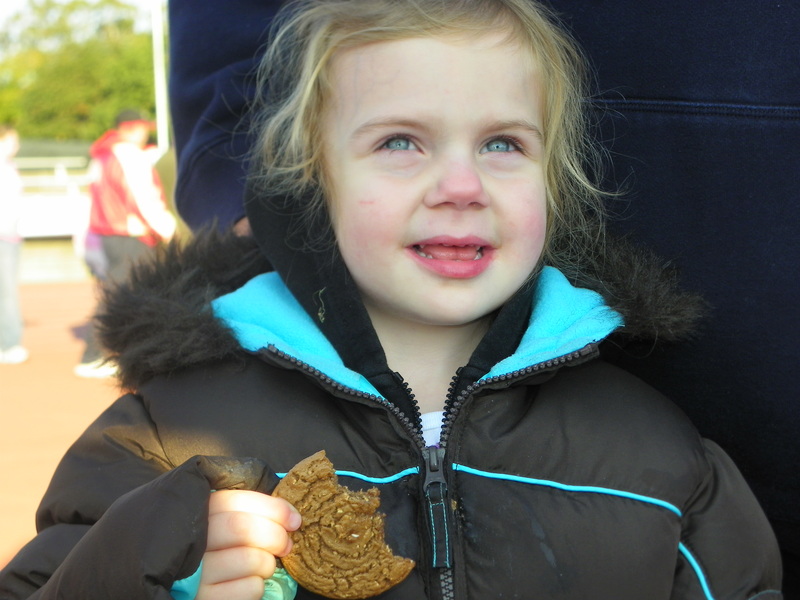 One of Indy's smallest walkers was more than happy to try the sugar-free oatmeal cookies handed out to everyone who attended the event on October 18th. (Indianapolis, IN, October 21, 2009) The Kroger Stores walk team and Hill & Valley (H&V), the largest exclusive manufacturer of sugar-free and no-sugar added snacks and desserts in the US, turned out in force to support the American Diabetes Association’s Indianapolis Step Out: Walk to Fight Diabetes this past Sunday, October 18, at IUPUI’s Michael A. Carroll Track & Soccer Stadium. The day dawned clear and cold, but an estimated 1200 registrants donned their walking shoes and warm sweats to enjoy the picturesque Central Canal through downtown Indianapolis to raise money and awareness for diabetes. The Kroger walk team raised more than $700 to be donated to the Indianapolis ADA Chapter. In addition, H&V has also donated $15,000 in-kind on behalf of Kroger Indianapolis to the national ADA organization. In total, the Indianapolis ADA office estimates that Hoosiers will raise more than $190,000 from the event. According to the Indiana State Department of Health, nearly 10 percent of Indiana adults (totaling 704,000) have diagnosed diabetes and another 26% (1.6 million Hoosiers) have pre-diabetes. Indianapolis Step Out Participants enjoyed Hill & Valley sugar free blueberry mini-muffins and specially formulated Step Out Oatmeal cookies at the Kroger/H&V Step Out Café before and after the event. “We’d like to personally thank Kroger and our broker, R.G. Sellers, who joined forces in Indianapolis to help us at this event and to fight diabetes,” said H&V CEO Scott Florence. Florence, whose own father suffers from diabetes, has been leading the charge in 2009 to brought together customers ¬– and 12 retail partners in 23 communities to support 24 Step Out events — all in an effort to fight one of the fastest growing diseases in America. Read a summary of the Quad City Walk here. View photographs of the Quad City Walk here. View photographs from the Philadelphia StepOut Walk here. View pictures from the Philadelphia retailer event here. Below, you’ll find our past two years’ news releases, media advisories and coverage involving Hill & Valley, Inc. Just click on the link to go to the story. Each page also includes links to related digital assets. If you have a special request or would like to set up an interview, please feel free to contact us.